I was nonchalantly checking out my stats when I fell upon the All Seasons website What did I see there: not one, not two, but three of my very own posts! Feeling good …..!!!! This is just a quiet little rave re that but while I am at it, I would like to say that I am mad at blogger: I am experiencing a problem with photos ie enlarging them and writing captions. I have checked everything out to make sure it isn’t just me – and it doesn’t seem to be – and made a complaint to Google. To date I have heard nothing back. I think that is pretty crummy. I’m not sure I’m that keen on Google these days …. The photo below is where I was today: on the island of Büyükada or Prinkipo, one of the Princes Islands in the Sea of Marmara, with a group of friends. It was a very windy day and at times we were a bit cold. But we flogged all the way up to Aya Yorgi, the Greek Orthodox monastery of St George, and had an unexpectedly splendid lunch. 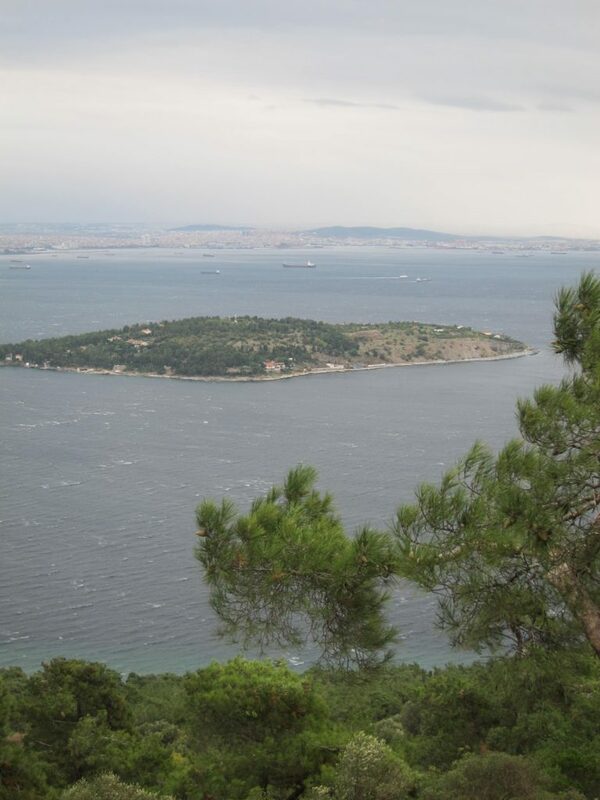 The view we had at our feet was of the island of Sedef with the city of Istanbul behind. It was gorgeous – and so was the meal! A huge thank you to Angela, for organizing it all! I've been having problems too. Keep being logged out half way through writing a post. I got so confused with re-logging on and getting kicked off that I ended up publishing half a post and erasing the completed one. It is so encouraging in a strange perverse way to hear this. And unbelievably frustrating. I am considering ditching blogger and going elsewhere. What do you think? nothing worse than blog problems. i get frustrated with them so easily and am horrible at resolving them! one of my favorite things in life is a meze spread! anything but politics these days. people in the US are crazy! half of the people are scared to death of the rest of the world and the other half just want us to stop trying to rule the world! But at least you've got your blog tech to help you!!! I get so cross with myself that I can't manage it myself. I can imagine that it must be a bit difficult in the US right now. We meet quite a few Americans here and there and it is interesting to hear their different points of view – which help us form our own. Yes, a meze spread like this one is hard to beat! Claudia, you are definitely NOT alone. We have the same problems with posting photographs and when we want to add captions, blogger seems to completely lose its mind. Text disappears, photos migrate to other places – it really makes us nuts sometimes. So thanks for the encouragement – we'll complain, too. Your blog certainly deserves the recognition from All Seasons. Blogger may be a pain but we certainly appreciate your putting up with it to provide us with such wonderful recipes and photos. Oh yet another blogging problem! I am sick of Blogger these days. I am still unable to comment on some blogs, even though it's possible on others. I don't receive email notifications anymore either, re comments on my blogs or others..very frustrating! 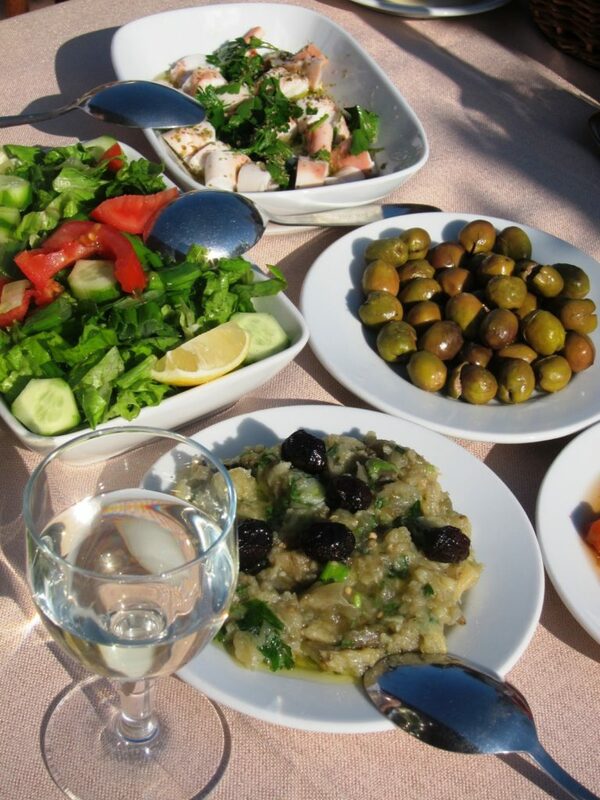 That meze sure looks appetizing, I love mezes I make a meal out of them. Would love to visit the Aya Yorgi and Monastery of St. George. I usually visit places that are of Greek Orthodox faith in Turkey as it is mine, but I'm not Greek. Beautiful scenery on the photo. Hi Claudia…..I'm originally Canadian born in Toronto,but my Grandparents on both sides are from the Ukraine almost a century ago…… I've never visited the Ukraine yet. My husband always tells me just take the boat across the Black Sea from Istanbul, but I never do…..maybe one day.. I did have a look at the Aegean Flavours but it's listed at £45 plus £9 to post back here. Hey hello Nigel! That's really interesting that you have had the same problem with wordpress as I always seem to hear that it's the best blog website around. And re cookbooks, yes there is one I would definitely recommend: Secrets of the Turkish Kitchen by Angie Mitchell. I think I have cooked my way through it by now and lots of the recipes are on my blog. The recipes are both authentic and relatively easy. Can't believe the price of Aegean Flavours :=)))) ! !